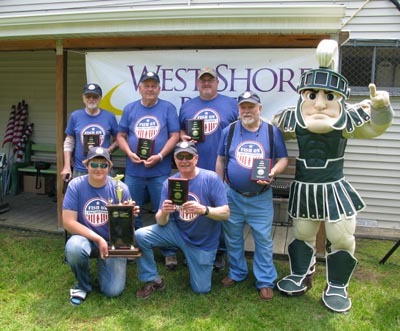 We took part in the inaugural Fish On For Freedom event today in Ludington. It was put on to show appreciation to veterans for their service to the country. We went north and set up in 110 feet of water on the bank. First rod in was a 7.5 color core with a regular size Blue Benny Fuzzy Bear Spoon. Before the board got into place it was dragging back with a Lake Trout on the other end. We took King on that same rod later in the morning. Second fish was a 17.6 lb. King on a 11′ white Paddle/Pickled Sunshine Action Fly 92 down on the chute rigger. We took a good King on a 300 Copper with a 10″ Green Bikini Spin Doctor & a prototype Dreamweaver meat rig. A 10″ White Crush Green Prism Spin Doctor & a homemade Pickled Sunshine Action Fly meat rig went twice on a high wire diver out 170 the first time & 210 the second. We missed a good fish on a 250 copper with a 10″ Chrome Kevorkian Spin Doctor/UV On Ice Big Water Rig. The rest of our Lakers came on a Tin Can Dodger/Green-Chartreuse Spin n Glo bouncing bottom. 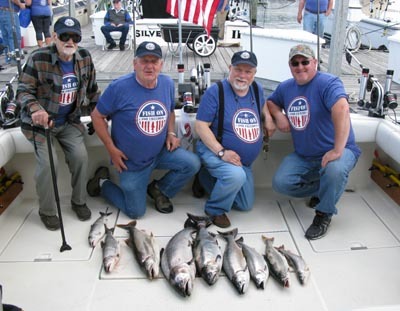 Our crew of veterans, Bill Downing, John Rodgers, Joseph Tyron and Paul Kazmierski and first mate Austin Tomasek did a great job and had a good time on the trip. The 17.6 lb. King landed by Joseph Tyron took the Big Fish Award and our team won First Place with a 3 fish total weight 42.35 lbs. It was a very well run event. Thank you to event organizers Brad Hackert, Adam Lamb, Shawn Pomorski, and Adam Knudsen. Job well done!